True stewards, staff at the Edmonton Valley Zoo provide the highest quality of care to the more than 350 animals that live at the zoo. 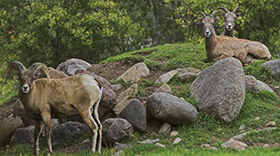 The living, breathing, individual animals that live at the zoo are the soul of the facility, situated in the remarkable North Saskatchewan river valley in the heart of Edmonton. Caregivers work together to support the nutritional, medical and behavioural needs of each animal. A priority of the zoo renewal is to recreate natural habitats for the animals that live at the zoo, enhancing their quality of life and allowing guests to better appreciate the natural world. These efforts support the best of care for the animals and showcase to zoo guests the need to make changes in their own lives to help habitat conservation efforts around the world. Animal Care: To ensure the animals receive the best possible care from highly skilled caregivers, the Edmonton Valley Zoo team focuses on continuous learning and employing best practices in veterinary medicine, nutrition, enrichments and habitat design. A new veterinary hospital opened in 2010. It includes a surgery, laboratory, quarantine area and space for animals needing longer-term care. This facility, along with advanced medical equipment, allows the zoo's veterinarian, animal health technologists and other staff to more effectively and efficiently care for the animals. The Edmonton Valley Zoo's animal care committee pulls together expertise from various sources to strengthen the focus on animal enrichment, nutritional standards and behavioural training. Learn more about the amazing animals at the Edmonton Valley Zoo. The Edmonton Valley Zoo team is passionate about working to preserve the natural world and promoting environmental responsibility. Zoo staff work with international organizations on ethical and strategic conservation projects – either actively raising animals in species survival programs or raising money and awareness – to support initiatives in other parts of the world. Animal conservation work around the world is important, but the work doesn’t stop there. The zoo also models green strategies in all it does here at home in an effort to promote environmental responsibility and reduce the environmental footprint of the facility. Conservation: The Edmonton Valley Zoo participates in the Species Survival Plan (SSP) to help ensure the survival of species that are threatened or endangered in the wild. Currently the zoo is engaged in the SSP with five species: Grevy's Zebra, Amur Tiger, Goeldi's Monkey, Snow Leopard, and Red Panda. The zoo will continue to pursue additional SSP opportunities. The Edmonton Valley Zoo will continue to support conservation initiatives by strengthening the promotion of these important programs with zoo visitors, assigning responsibility for conservation programs to a key staff member and establishing clear conservation targets. Current and future contstruction projects are focused on recreating natural habitats and promoting environmental responsibility. Along with providing a better life for the animals, guests are given a deeper understanding of the natural world. Learn more about conservation efforts at the zoo. Encourage and inspire learning through engaging and memorable events and activities. 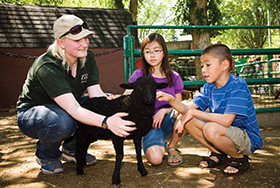 Thousands of Edmonton region students attend zoo school each year. Zoo school educates young people about animals, their habitats and the challenges to their survival. The zoo also provides structured public programming for all ages through daycamps and specialty programs. Staff have been able to broaden the scope and reach of educational programming with the state-of-the art education centre that opened in 2014. The zoo also supports research through education partnerships and through conservation program participation. to interact directly with animals. Plans are also underway to develop internet tools and programs to increase the reach of the zoo and better retain engaged audiences. 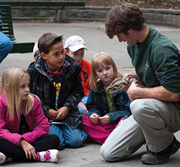 Learn more about Zoo School, daycamps, and programs. Fun experiences and rich interactions create lasting memories. At the Edmonton Valley Zoo, we recognize that for learning to be engaging and memorable, it should be FUN! And when you visit a zoo the fun centres on animal experiences and learning through play and activities. Children can appreciate the scale of a whale as they play on a full size whale skeleton replica; they can observe ground squirrels and then imitate these animals in an interactive play burrow. Visitors will walk through a unique Arctic landform – the pingo – where they will discover the cold heart of the pingo's ice core. The trail system features atmospheric play — an interactive feature that interprets rain systems and allows visitors to cool off on a hot day. These experiences and others will keep younger visitors engaged as they learn about the world around them. Exhibits: With the new entry area, the fun begins even before visitors walk through the main gates. Guests will be greeted by frolicking North American river otters. From there, visitors will be invited to follow The Wander trail system that features trout ponds and water play areas, along with spots to picnic. Staff: Everyone at the zoo approaches their work with enthusiasm and a desire to create memories for all who visit. The zoo will continue to cultivate a culture focused on providing memorable and engaging experiences. The zoo will also develop a customer satisfaction and evaluation process to continuously improve the visitor experience. A visit to the zoo should be fun. And that's a focus at the Edmonton Valley Zoo. We centre fun around animal experiences and learning through play.